On and near the roundabout on the N33 near Google in Eemshaven there is now a striking artwork in the form of a large IT plug. 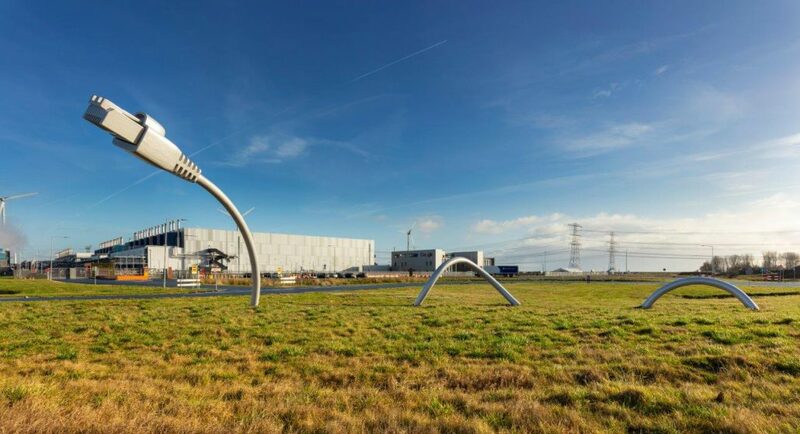 This artwork symbolises the international data hub that is Eemshaven with its many fibre-optic connections. Eemshaven literally connects continents and that’s why the eye-catching artwork has been given the name ‘Connecting the Continents’. The artwork was officially unveiled on Wednesday 13 March in the presence of various guests by CEO Cas König of Groningen Seaports and his illustrious predecessor Harm Post. During his farewell reception several companies made donations as a kind of farewell gift for the purchase of this artwork, designed by Albert Buring and Paul Mulder of Studio 212 Fahrenheit and Piebe Piebenga. Groningen Seaports/Dataport Eemshaven looks back on a very successful event and thanks all those who attended. As well as attending the unveiling of the artwork, guests were given a guided tour of the energy port (8,000 MW of installed capacity), which of course also took them past Google’s impressive data centre. The artwork ‘Connecting the Continents’. In the background Google’s data centre.